Today, more than a billion people around the world begin observing the holy month of Ramadan, fasting from dawn to sunset, gathering with families and loved ones for meals, laughs and stories. Growing up, the best part about Ramadan was eating way too much lentil soup with my family and catching up on the latest episode of our favorite series, "Bab Al-Hara." Today, living more than 1900 miles away from my family, I rely on technology to get close with them during Ramadan. Whether it’s sharing moments on Hangouts, my sister sending me pictures of the iftar spread of the day, or receiving an avalanche of recipes from my mother for me to save and try out, technology helps us stay connected and celebrate Ramadan together even when away. In fact, technology helps more than 200 million Muslims living away from their families connect and share moments with loved ones. People look to Maps to navigate traffic and make it home from work for Iftar, download Google Play apps to plan their day around the sunset and sunrise, and look up Ramadan opening hours of their favorite local shops and restaurants. 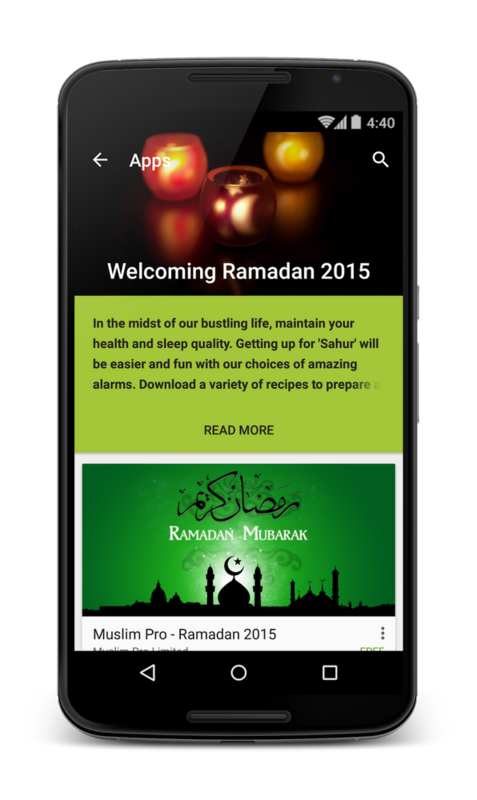 To help you get the most out of Ramadan, we've launched My Ramadan Companion (g.co/Ramadan), which gives you customized and locally relevant information, tips, and other content highlighting the richness of what the web can offer during Ramadan around you. You can find out the sunset time in your location and plan your day accordingly, check out the traffic in your area, navigate to the closest charity Iftar, find and share recipes, and enjoy Ramadan content on YouTube ranging from drama series and comedy sketches and health tips to stay fit during the 30 days of fasting. Depending on your location, Google Now will show you a range of relevant cards with popular YouTube videos, latest Ramadan news and information, and recommendations for apps that alert you to wake up for Suhur, enable you to design greeting cards for Ramadan to share with the family, find Halal restaurants around you, and countdown to Iftar time. With My Ramadan Companion, we hope we can help you take care of the little things, so you can focus on the big things. Ramadan Kareem!